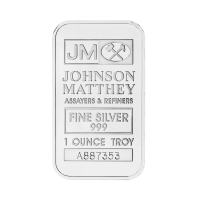 גוש ופלח כסף Johnson Matthey משקל אונקיה These Johnson Matthey Bars are 999 Fine Silver, and weigh 1 Troy ounce. Each bar has a unique serial number. These silver bullion bars are made by Johnson Matthey, a refiner that has been in business since 1817. Renowned the world over for the quality of their products and the reputation that has endured for nearly 200 years.